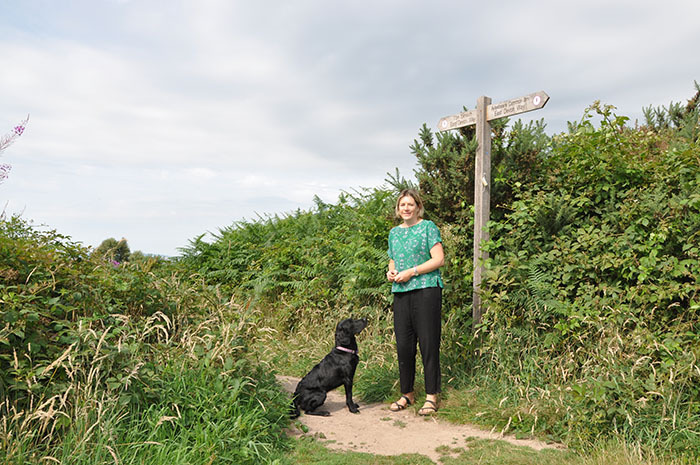 I’m Julie, the co-ordinator for Devon Loves Dogs pictured with my dog Maisie. My role includes educating dog walkers about responsible ownership and the important local wildlife. But, just as importantly I want to understand the issues that dog owners currently face so that I can represent the needs and concerns of dog walkers to landowners and managers. Devon Loves Dogs is jointly funded by East Devon District Council, Teignbridge District Council and Exeter City Council. Other organisations such as Natural England, Clinton Devon Estates, RSPB, Devon Wildlife Trust, the Exe Estuary Management Partnership and the National Trust provide advice and guidance. Together, all of these organisations have formed a partnership known as the South East Devon Habitat Regulations Partnership (SEDHRP). It has been formed to protect the three very special wildlife sites of the Pebblebed Heaths (Woodbury and surrounding commons), the Exe Estuary and Dawlish Warren.